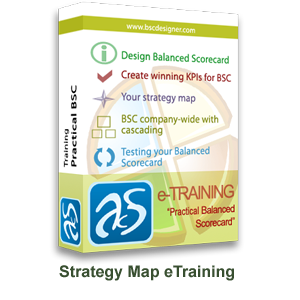 It is always interesting to see an example of real Balanced Scorecard with real strategy map. One was released by BSC Designer for the Dental Practice. Go to the Dental Practice BSC project. 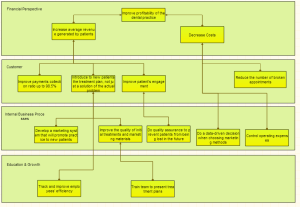 The strategy map uses the classical perspectives of the Balanced Scorecard where on the top there are financial objectives, linked down by cause and effect connections to other perspectives. This entry was posted in Articles on October 23, 2013 by admin. Companies use several strategy development methodologies in order to streamline the planning and strategy development of the processes of the company in order to improve market value and profitability of the company. Tangible assets of the company can be measured by traditional measurement metrics; however these traditional metrics are unable to measure the intangible assets of the company which 75% of the company’s market value. In order to measure intangible assets, a technique called balance Scorecard was developed by Robert S. Kaplan and David P. Norton. Later on this team of researcher introduced a new and improved technique for measuring intangible assets of the company. This technique is called the strategy map. Strategy map basically defines the relationship between the intangible assets of the company and the corresponding value creation related to these companies. Managers can use strategy maps to streamline and manage the people, technology and capital of the organization to gain maximum value creation for the company. Strategy Map is a visual representation or a diagram which depicts the relationship between the four strategic objectives of the organization and explains the strategy development process in terms of cause and effect relationship. The strategic objectives of the organization described by strategy maps are of four types, it includes financial objectives, customer objectives, process objectives, and learning and growth objectives. Developing strategy map is a multi-step process however the key principles while designing a strategy map are as follows. Brevity is the soul of wit. Same applies to the strategy maps. The size of the strategy map should not be greater than one page if drawn on a page or half of the normal drawing board if drawn on board. It allows reader to easily read all the contents of the map without having to scroll down or turn the page. It not only saves time but also summarize the object efficiently. Common principal while designing strategy map on paper or a wall is to divide into four equal sections by two drawing two perpendicular lines. Top right portion should contain financial objectives, top left corner should contain customer objective, bottom left portion should contain the process objectives and bottom right portion should contain learning and growth objectives of the company. All these objectives have been described in detail later. 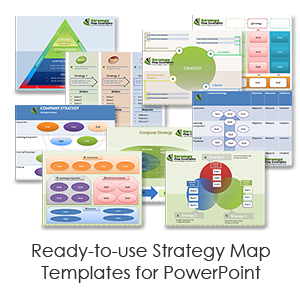 Ready-to-use Strategy Map Templates allow to achieve better visual representation and as a result better business effects. The first and most important principle while developing strategy map is to remove all the ambiguities in the mission of the organization. Mission is the fundamental purpose of the organization which defines what we want to achieve as a whole. Describing financial objective of the company is the most important of all the objectives. In financial objectives of strategy, it should be clearly mentioned that what are the financial goals of the company and what steps need to be taken in order to achieve those financial goals. For example in public sector companies the goal is to create value for shareholders of the company where as in public private sector organization, maximum revenue generation and increased profitability are usually the goals of organization. 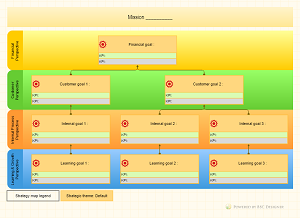 Strategy maps must include the customer objectives. It means what should the company do in order to attract more customers and what are the goals that a company wants to achieve by acquisition of more customers. What are the initiatives that need to be taken in order to differentiate the company from other companies in terms of customer preference. 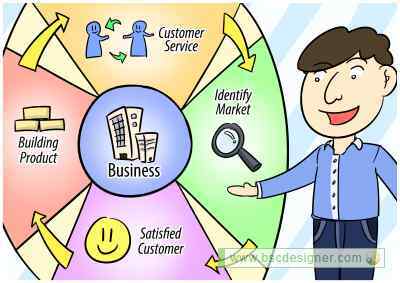 Principle of achieving process objective is very crucial as it also help achieve the financial and customer objectives. While defining process objective in strategy map, it must be kept in mind that how can we achieve our financial and customer objective by implementing this process or what will be the relationship between the process objective and the customer and finance objective. For example a process objective can be to speed up the process of selling and feedback which might help us to increase revenue and sale which is a financial objective. Organizations encourage growth and learning among the employees but these is not seen as tangible organizational objectives as traditional metrics are not suitable for measuring these objectives. These objectives include the organizational culture, skills and technology being used. Learning objective should define that what learning and growth impact we want on our employee or what is our goal in terms of cultural environment how we want to change it. All these objectives should be included in learning and growth portion of strategy map. After individually describing several objectives, develop relationship between each objective and define how one object impact the other objective and how an objective can help to achieve other objective. The relationship between objectives and goals can be defined by connecting them with arrows. Strategic analysis of the market, suppliers and shareholder needs to be done after the objectives and goals have been defined. Strategic analysis involved detailed analysis of impact of trends in contemporary industry and their effects on the company and the competitors of the company.. Internal analysis, external analysis and SWOT analysis are some of the techniques used for analysis. Strategic analysis helps in strategic formulation which is the last principle of strategy maps. This is the last step in developing strategy map, it contains that what process will be chosen to achieve the objectives and goals which have been set and what needs to be formulated to improve the implementation strategy to achieve the desired objectives. Strategy map helps organization in devising a strategy which help them achieve their tangible as well as intangible targets by organizing the objectives and corresponding strategy to achieve those objectives. It has been a successful planning technique and more and more organizations are now opting it to plan their organizational strategies. This entry was posted in Articles on July 20, 2013 by admin.